With its latest innovation Adria, Italy-based Italamp aims to continue its long tradition in the world of chandeliers, while opening new avenues where tradition meets innovation, thanks to both design and technology. 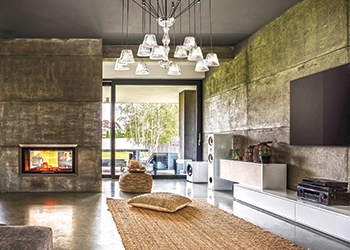 Adria is a contemporary alternative to a chandelier, reinvented with a fresh, dynamic approach, which is the distinguishing trait of Nava+Nava designers. Deriving its name from the Adriatic Sea which has played a key role in human evolution and fosters the exchange of cultures and goods, Adria’s concept is a thread that connects the past to the future. “While the most characteristic elements of chandeliers – central stem and bobeches – have been maintained, they have been redesigned in a play of balances to create a bold effect,” says a spokesman for Italamp. “Adria is a ‘destructured’ suspension light that stunningly combines transparent glass shades with slender, minimalistic and unobtrusive supports,” he adds. Paolo Emanuele Nava and Luca Maria Arosio of Nava+Nava Design Studio explain: “It features luminous drops suspended in mid-air, an entwining of delicate yet bold ‘strings’, disconnected elements that take shape in a skilfully ordered combination of innovation and classic atmospheres. Diametro ... now also offered in white. Ritmonio of Italy has boosted the choice afforded by its two iconic models of faucets – Haptic and Diametro 35 – by offering the series now in black and white finishes. 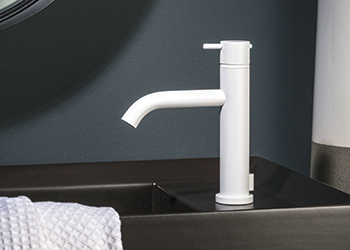 “A contemporary design combined with the tradition of ‘Made in Italy’ excellence makes these products unique,” says a spokesman for the company, which is a leader in sanitary ware and in safety valves production. The special mat texture in black and white – besides ensuring excellent adhesion and resistance – renders these products elegant and exclusive, he adds. According to the spokesman, the new finishes are a result of a study to achieve high quality standards: They resist corrosion, light and water action, combining durability and ease of maintenance with a delightful aesthetic, suitable for enriching any bathroom environment. Ritmonio comprises The Factory Division, which for more than 60 years has manufactured safety valves and brass, copper, aluminium and stainless steel components; and the Bath and Shower Division, which produces designer taps and fittings for bathrooms. 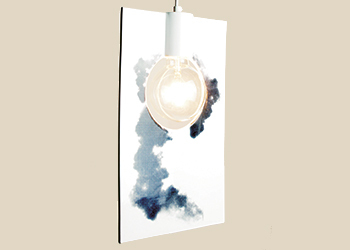 Neo Design Studios says its latest hanging light fixture is set to create a new trend in the lighting sector. Smoke, as it is known, is a unique flat vertical ceramic suspension lamp that offers an elegant and graphic lighting solution for any kind of space, giving a 360-degree beautiful light through its ceramic support, says a spokesman for the Germany-based design studio. Smoke measures 83 by 73 mm, weighs just 400 gm.